Cycing is supposed to bring pleasure and when it's painful, painful in a good way. Like sore legs after spending all day in the saddle. Well, the Wednesday night ride brought a different kind of pain and it wasn't good. DC superstar Markie Mark got intimate with some cobblestones and felt the pain in a bad way. Dislocated shoulder. Ouch! It was a loud wreck and I knew it hurt as soon as I turned around and saw him sprawled in the street. There was a serious look of agony on his face and it didn't go away. Then to make things turn from bad to worse, good Samaritan Ken, who had just dropped Mark at the hospital, had his C-dale stolen outside of the bar by some scum-bag fukker. Oh, and BBC will be shut down real soon. 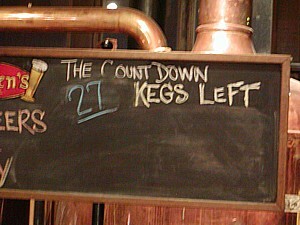 The keg count was cut in half from last week. I'm not expecting them to be open for next Wedneday's ride. R.I.P. Let's hope the weekend has something better in store. 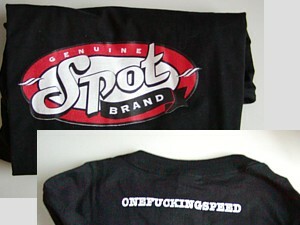 Now this is true luv: a Spot shirt from my lady for V-day. Swamp like conditions locally so I spent the weekend solo riding on the fixed. Sort of a lazy pace, 2 days of soaking up the sunshine, realizing that every ride does not need to be a race, some times it's cool to just spin and wander around without a specific destination in mind. More rain the other night means the asphalt attack again tonight, we'll head down to Baltimore Brewing and see if they've got any kegs left. Would be kind of cool (and sad) to be there when the last keg kicks. Wonder what the chances are?